Marcus Rashford is "not a natural goalscorer" and needs to improve on the back of recent misses, says Paul Merson. The forward spurned England's two best opportunities during their 0-0 draw in Croatia on Friday night, after missing another two good chances for Manchester United against Newcastle on October 6. Rashford has rarely had the opportunity to show his ability as a central striker for club or country - and after starting in attack for United in their defeat at Brighton last season, boss Jose Mourinho said the game had shown why he chose to play Romelu Lukaku so regularly as their lone forward. Lukaku's shot conversion rate is five per cent better than Rashford's in the Premier League since the start of 2017/18, something Sky Sports pundit Paul Merson said was down to the 20-year-old's poor finishing ability. "I don't think he's a gifted finisher, he's not a natural goalscorer," he said. "People will say he scored three in three for England before the Croatia game, but he's not a natural goalscorer. "When you're playing for a top club, and playing for England, you need to be putting chances away. You look at Romelu Lukaku scoring two the other night for Belgium - he's a goalscorer. "There was a header against Newcastle from six yards out, he put it wide, and the chances in Croatia the other night, you can't play up front for one of the biggest clubs in the world and miss chances like that. You need to be putting them away to play up front for Manchester United." 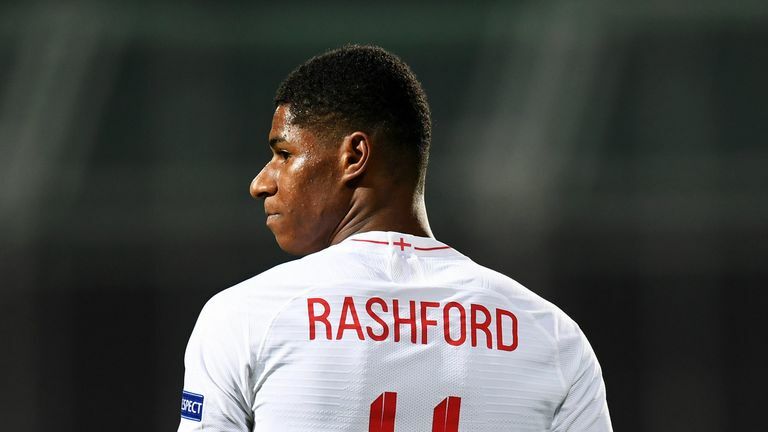 Rashford will start England's Nations League game in Spain on Monday night in a show of support from Gareth Southgate, who last month said he would go on to be a "top player" for club and country. And speaking after the draw in Croatia on Friday night, former England and Liverpool striker Emile Heskey told Sky Sports there was some encouragement to be taken from the forward's performance. "It's great that he's getting in those positions," he said. "A lot of players, when you miss a chance like the first one, you don't want the ball and your head goes down.